Are you tired of bump updates yet? I know I am. Well, just a little bit. At this point I am READY to have this baby out. Yesterday I ordered her diapers and somehow that made things suddenly real. Wow. This is happening. And soon. Like I said in my last bump update, all the aches and pains, swollen hands and feet, sore back, and everything like that are here, and here to stay. Buuuuut, I only have five weeks left. SO. I can do this. How far along: 35 weeks. Size of baby: baby is about 18 inches long and weighs about 5 1/2 lbs. fruit size she's about the size of a honeydew melon. Sleep: sleep? what is sleep? haha. really though. I'm having a lot of trouble sleeping, and having a teething toddler is not helping (she does have two molars in though!). Cravings: I'm still have to be careful what I eat. I'll make a whole meal and then realize that it's making me sick and I can't even eat it. Sigh. 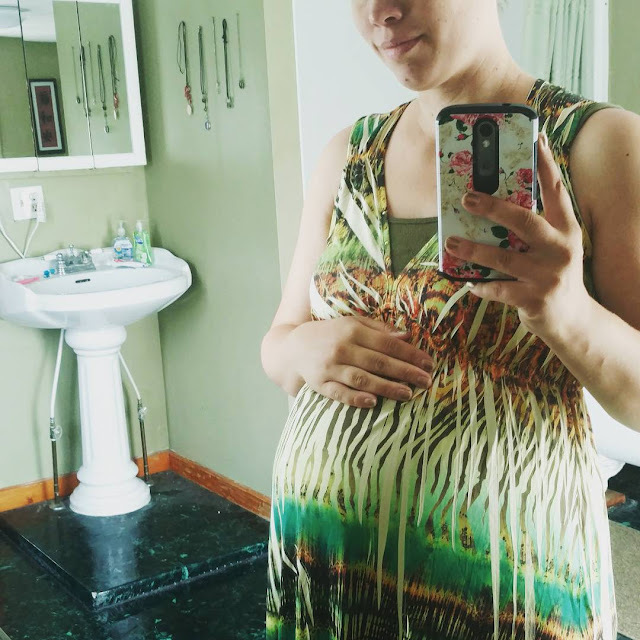 Clothing: when I was in New England I found some cute new maternity stuff and I think that will hold me over until after the baby is here (although, who am I kidding-I'm sure I'll still be wearing my pregnancy outfits after the baby arrives). Baby movement: never. stops. moving. this is one busy and ready to get out and take on the world baby. basically I feel like Bella Swan when she's pregnant (sorry, you'll only get that if you've watched/read Twilight). Best moment this week: Adri pulling up my shirt and saying "hi Bump!" and then giving my belly a kiss. Today when Adam get homes he's cutting the grass, and I'm going to refill Adri's pool and water table since it's the first nice day all week. Later my mom and dad and a couple of the kiddos (two are on a church trip) are coming over for dinner (lasagna) and to hang out. Tomorrow we have a dump trip and then are taking Adri around for Open Farm Day (read more here). I'm sure she'll love seeing all the animals!